What is breast cancer screening? What services does the Cancer Institute NSW provide? Who should consider a mammogram? Breast cancer is a collection of cells in the breast tissue that grow in an uncontrolled way. It is the most common cancer affecting women in NSW, with 1 in 8 women developing breast cancer in their lifetime. In 2018 alone, it is expected 5,788 people will be diagnosed with breast cancer, and the disease will cause 980 deaths. A screening mammogram (breast x-ray) is the best method to detect breast cancer early for women over the age of 50. Finding breast cancer early improves survival. We encourage women aged 50–74 to have a screening mammogram every two years. The BreastScreen Australia program was introduced in 1991. From 1993 onward, there has been a steady decline in mortality rates from breast cancer for women aged 50–69. A screening mammogram is the best method to detect breast cancer early for women over the age of 50, however 50 per cent of women aged 50 to 74 in NSW are still not being screened. All women aged 50 to 74 should have a mammogram every 2 years. 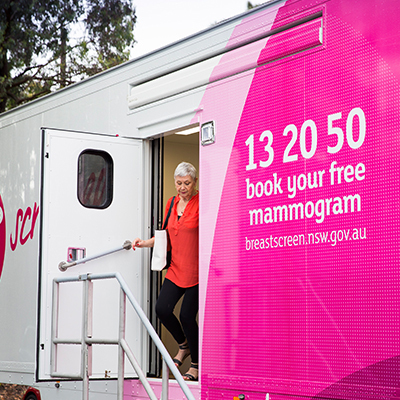 Visit our BreastScreen NSW website to find your nearest service, or call 13 20 50 to book your free mammogram. Find out why it's important for women to have a mammogram and how it can help to reduce the impact of breast cancer. Who should be screened for breast cancer? Find out the age ranges where mammograms are most important. BreastScreen NSW is a free, government funded service that aims to detect breast cancer early before it has a chance to spread. We produce breast screening campaigns to encourage more women in NSW to get mammograms - browse the media and find out about the campaigns.